From the whistle-blower who revealed the Pentagon Papers, an eyewitness exposé of the dangers of America's Top Secret, seventy-year-long nuclear policy that continues to this day. ...one of the best books ever written on the subject—certainly the most honest and revealing account by an insider who plunged deep into the nuclear rabbit hole’s mad logic and came out the other side ... it’s rare to get the history laid out in such human detail by someone who was so immersed in the scene ... The marvel of Ellsberg’s book is that he captures that world from both of those angles—that of the ground-burrower who can’t see past his confining premises and that of the mile-high flyer who views the landscape in its full moral context—without flinching from the fact that he has occupied both of those personas in his lifetime with equal measures of passion. The book’s exposés, such as they are, offer for historians not much that is new or revelatory, but casual readers will probably be shocked by just how boneheaded and illogical much of the Cold War’s grand strategy really was. Yet Ellsberg’s book, perhaps the most personal memoir yet from a Cold Warrior, fills an important void by providing firsthand testimony about the nuclear insanity that gripped a generation of policymakers … The Doomsday Machine is strongest as a portrait of the slow corruption of America’s national security state by layer upon layer of secrecy. He relates how the Cold War, the nuclear build-up and trillions of dollars of defense spending were compromised by information purposely withheld from the policymakers and politicians who debated and shaped our path. 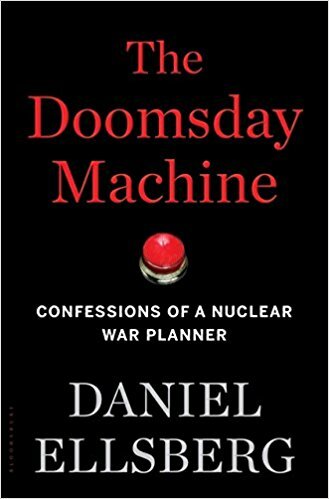 What did you think of The Doomsday Machine: Confessions of a Nuclear War Planner?